As expected, Indianapolis is out of the Formula 1 2008 calendar and the only American driver, Scott Speed has shared the Brickyard's fate. The Scuderia Toro Rosso team said that Sebastian Vettel would replace Speed for the rest of the season starting with Sunday's race in Budapest, Hungary. Vettel, who is 20, had been a test driver for the BMW Sauber Formula One team. Why American drivers have this challenge in succeeding in Formula One is a mystery to me. 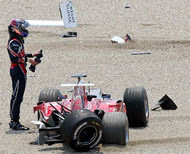 Speed is not a bad driver, yet he has not earned even a point in Formula 1. His double 9th position is his best result. Scott Speed has shown considerable promise, much more than Michael Andretti from the mid 90's but not enough to keep his stay in an European-dominated sport. Let's hope that we see American drivers in the royal motor sport as well as the US Grand Prix in the future.